From wandering the woods near her childhood home to building her career at the Nature Conservancy of Canada, Lisa McLaughlin is no stranger to conservation. Lisa began working for NCC as an intern the summer after she graduated from her masters program at the University of Guelph. 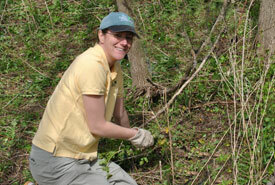 She has worked her way up to become NCC’s acting vice-president, conservation. Lisa has helped mould many programs and projects over her time with NCC, including Conservation Volunteers — one of NCC’s most impactful Canada-wide programs. Lisa continues to lead the way for women in conservation and her work to help protect Canada’s landscapes is far from completed. RB: What is one of your first memories in or of nature? LM: My first memories in nature are of camping with my family and wandering the woods near my house. LM: My first job was working for the University of Guelph in Algonquin Park at the Wildlife Research Station. I was researching snapping turtles and painted turtles. That job taught me many life lessons: how your passion can be your work and how work can be your passion, that there are other people in the world who are wildly committed to conservation, research and science (when you meet them they will become lifelong friends) and to always bring a compass. LM: An amazing aspect of my job is that there is no typical day. Sure there are reports to read and emails to send, but I also sketch out new initiatives, brainstorm with colleagues, talk to partners, write policy, review procedures and, above all, solve problems. RB: Tell me about a time you consider to be your “best moment in conservation.” This could be a moment you discovered something in nature, a moment you saw a species or something you learned about yourself. LM: I’m fortunate to have had many “best” moments — from watching a mother bear scold her two rowdy cubs who were goofing around on the road, to watching a pack of wolves work as a team to catch an elk. But maybe my favourite was gliding in a boat, next to a basking shark that was feeding at the surface of the water in the Bay of Fundy. RB: Why is it important for women to be in conservation? LM: Women around the world are disproportionately impacted by the effects of climate change and poor natural resource management for a variety of social and systematic reasons. We also know that women play a key role in sustainable development and climate change mitigation. The International Union of Conservation of Nature has created the Global Gender Office to raise awareness of and bring a voice to these issues. In Canada, while women hold many different positions in conservation, research and the environment, there is still work to do in attaining gender pay equity and filling positions on corporate and not-for-profit Boards of Directors. RB: What advice do you have for women looking to make a career in conservation? LM: My advice is to explore many different aspects of conservation when you’re just starting out. Try field work, try lab work, organize your community to get involved in conservation, learn about indigenous traditional knowledge. Find mentors and reach out to them.